It would be more accurate to add the words “in French” to this post’s title since the prize really goes to The French Chef Cookbook by Julia Child. It was the companion to her public television series of the same name that ran for several seasons in the 1960s. Many of the recipes seemed way too complicated for me but she was so entertaining it was hard not to tune in every week. 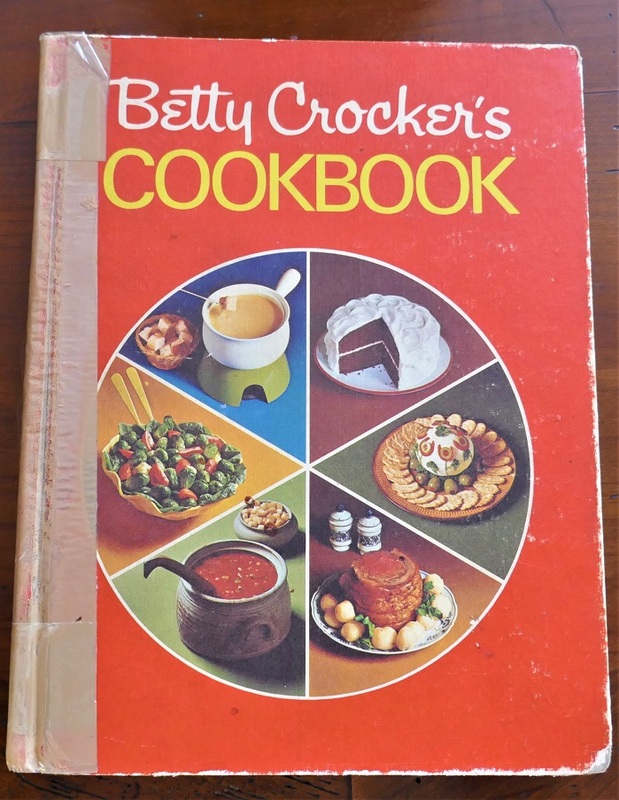 When we made the move here 3 years ago, almost everything we owned got left behind, including that book but we did bring the one cookbook that both of us owned when we combined households decades ago: Betty Crocker’s Cookbook. I felt confident that should we grow tired of exotic sounding foods like soupe à l’oignon, coq au vin, or tarte tatin (as if we would) then having a tried-and-true version of beef stew, fried chicken, or apple pie handy would be all the comfort we’d need. There’s only one problem; these recipes were written for an American audience and we don’t live there anymore, so it was time for a change. People preparing to move to France often ask us what they should bring with them and something that we always put on their list is a set of measuring cups and spoons. Since everything here is metric and most ingredients such as flour and sugar are weighed rather than measured before being added to the mixing bowl, it’s helpful when you’re following one of Betty’s or Julia’s recipes. Want to make chocolate chip or butterscotch cookies? Better stick in some bags of those morsels along with some cans of pumpkin for your pies since we’ve not found that here either. Of course you adapt by finding alternative products or making your own chips, for example, by dicing a chocolate bar. One more step you can take, in the spirit of fitting in, is to buy a cookbook printed in France, and that’s exactly what we did. In the US we had 300 television channels to choose from but the remote control seldom drifted from the 3 networks devoted to travel, home and garden, and food. We have about half that number of choices here, none of which devotes the entire day to one of our favorite topics, so we’ve had to do some searching. It’s easy enough to find French programs that involve food such as Top Chef, Kitchen Nightmare, An Almost Perfect Dinner, and Best Pastry Chef but you have to look further for programs that actually show you how to prepare a dish. TV chefs including Norbert Tarayre and Julie Andrieu give some instruction in their shows but the antics of home cooks or the beautiful scenery of the place they are visiting sometimes cause distraction. 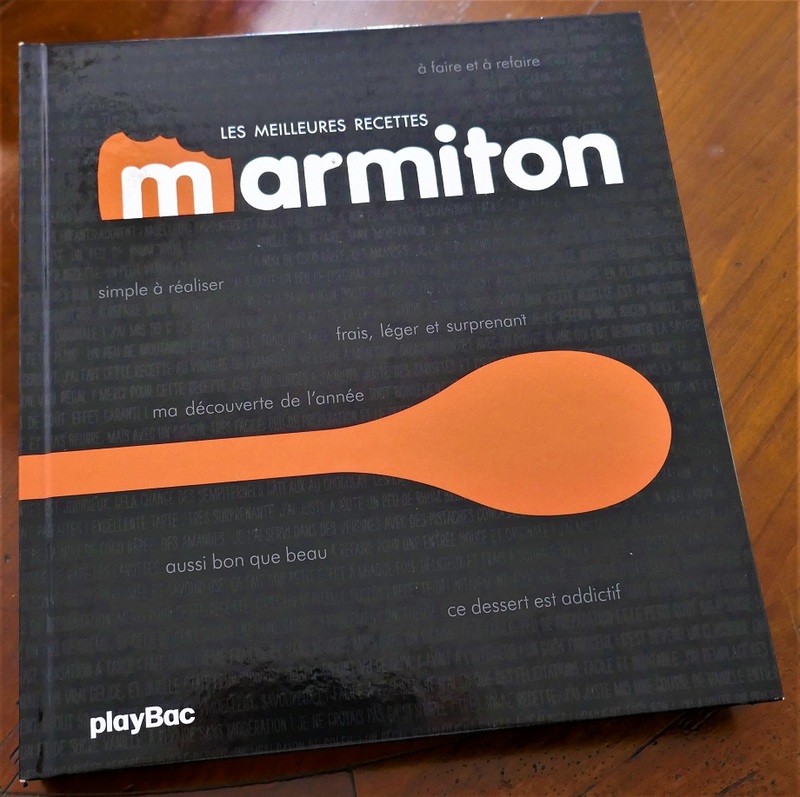 Then we found Marmiton https://www.marmiton.org/ that seems to do it all: recipes, videos, a Facebook page, a YouTube channel, and a bimonthly magazine. Yes, they even have cookbooks, one of which we now own, Les Meilleures Recettes (The Best Recipes) with a side note “to make and remake”. Sounds perfect and with the bonus of no longer converting cups of flour into grams or a tablespoon of milk into milliliters. Of course, there are new terms to learn like étalez, napper, faites tremper, and what in the world is a cocotte? To find out, I’ll check the kitchen dictionary (link below) and for fun, a handy wine tasting glossary I found at the same time. Bon appétit! Posted on February 3, 2019, in Life in France and tagged Americans in Carcassonne, Food, Life in France. Bookmark the permalink. 3 Comments. Wonderful. So many recettes, so little time! I’m originally from MA and Julia Child was a favorite of mine. I saw her strolling along with Paul, hand in hand, at the Wellesley Ladies Club dog show one summer. I was starstruck! A real french couple now…. because members of the Marmiton’s club !!!! !